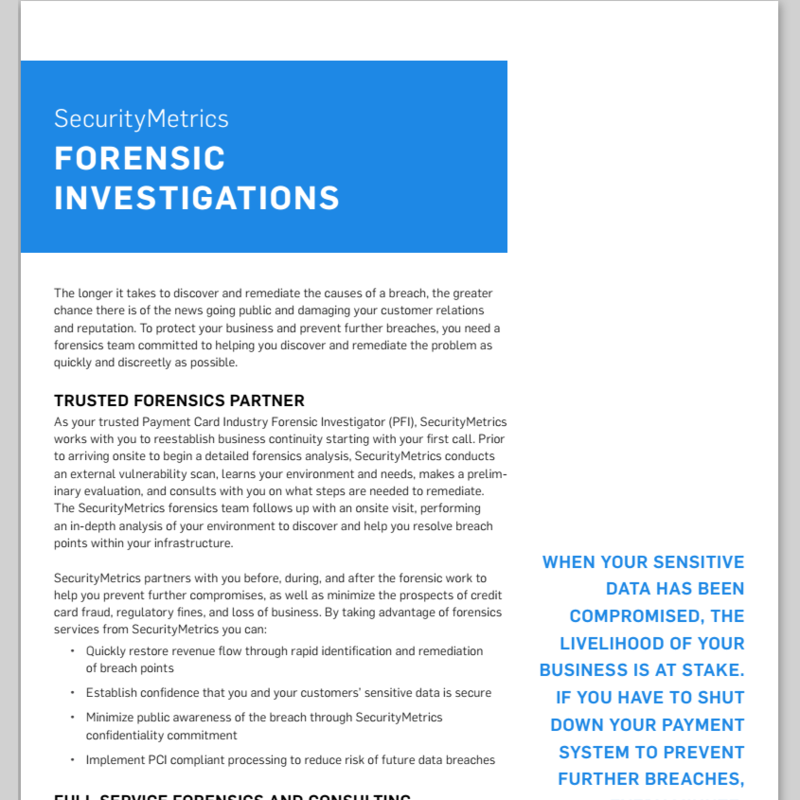 To minimize breach impact and maintain your reputation, SecurityMetrics PCI Forensic Investigators (PFI) work with merchants, healthcare providers, and legal entities in confidence to help organizations quickly recover from compromise. SecurityMetrics' Forensic Investigators have years of experience and expert tools that provide a fast recovery solution. Our investigators work with you in confidence to identify all exposure points and provide necessary education to achieve a full recovery. After discovering the cause of breach, SecurityMetrics' Forensic Investigators immediately advise how to patch breach points. Time is taken to ensure you understand your responsibility so you can continue to run your business without continuing to leak data. 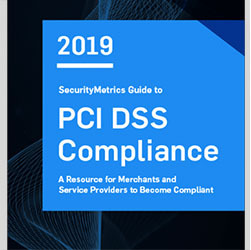 The only way to reduce the likelihood of future compromise is to implement data security best practices, including complying with PCI Data Security Standard (DSS) compliance, HIPAA compliance, and other compliance mandates. SecurityMetrics' Forensic Investigators provide best practice recommendations for HIPAA compliance, PCI validation, and other security mandates to help you maintain a secure environment. SecurityMetrics provides an initial consultation on immediate steps you should take to stop the loss of payment card data, protected health information, or other sensitive data and minimize the damage to your business and customers. Compromise hurts. 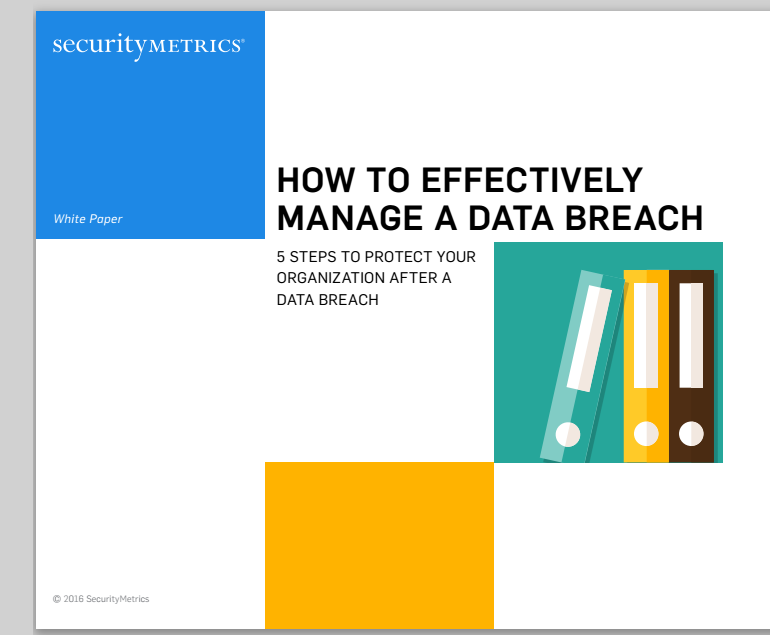 SecurityMetrics makes it a priority to inform, educate and answer questions to ensure you know how to quickly recover from a breach. From start to finish, SecurityMetrics provides a higher standard of customer service to ensure you can quickly return to business as usual. As technology changes and the criminal toolkit expands, SecurityMetrics' PFI continually adjust and create new tools to analyze cyber landscapes and help you recover from compromise. SecurityMetrics analyzes and interprets the available forensics data to discover how, where, and when the breach occurred, as well as the vulnerabilities that allowed the breach to happen. The analysis determines what sensitive data was compromised or is at risk. 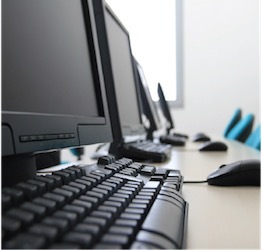 Where applicable, it also reveals aspects of the environment out of compliance with PCI or HIPAA requirements. SecurityMetrics first files a preliminary report on the compromise. Once the investigation is finalized, a final report is submitted to appropriate parties. SecurityMetrics then assists you in a summary-of-events conference call with the appropriate parties. The call details the compromise and demonstrates how the situation was resolved. SecurityMetrics pricing is simple. There are no hidden or hourly charges and no add-on fees. SecurityMetrics gives you one price that won't change.